Rock climbers are advised to work on their weaknesses in order to get better. The trouble is, since my injury, I’ve had quite a few weaknesses. 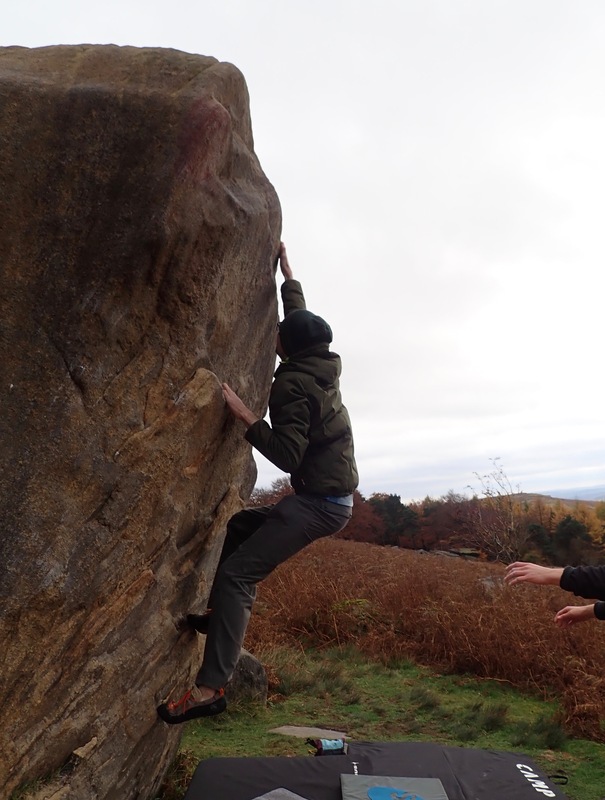 Me climbing the problem Wall End Slab Direct Start (V0 4c) at Stanage Plantation. A piece of advice that I’ve read in lots of different places is that you should work at getting better at the things you are weak at if you want to become a better rock climber. The thinking behind this is that people tend to avoid the things they’re not very good at. A lack of practice means that you don’t get better at the thing they’re shunning and so continue to avoid it. In rock climbing, you could be avoiding something because you find it’s too physically hard and/or you cannot master the technique. For the first few years after I started climbing my particular weakness was smearing. It felt insecure, unnatural and unsafe. So, I tried to climb routes using as little smearing as possible. This was a bit of a challenge as I was doing a lot of gritstone climbing at the time. However, somewhere along the way I did enough smearing to get the hang of it. It went from being unnerving, to being another useful way of getting up a climb, to being fun. I now really enjoy smearing up a featureless gritstone slab. This is why I try to follow the advice about working on your weaknesses. Every time I go to the climbing wall I do a few overhanging problems specifically because I know I find them difficult. The challenge I have at the moment is that the number and intensity of my weaknesses has increased. The amount of time I took off climbing because of my injury (and the resulting surgery) has made me less physically strong, and made my climbing technique blunt and rusty. I’ve been working on these weaknesses with physio exercises and trips to the climbing wall. It’s only recently that I’ve felt able to work on them in the outdoors as well. Last Saturday the first weaknesses I worked on was rusty technique. However, I tried to start easily by climbing a few nice gritstone slabs at Stanage. Despite a few slips, my smearing was better than my last trip to the Peak District a few weeks ago. It felt like the bigger challenge was trying to stop my bouldering mats from blowing away in the strong winds. The next weakness I tried to work on was dynos. During repeated attempts at a problem on the Lone Boulder, I managed to tap the hold, but not actually hold it. This was a pure problem of technique, as I failed to coordinate my legs and stretched arm. Seeing the other people I was climbing with all make the move effortlessly helped me because I could see what could be done. They had simply worked on these moves more than me. 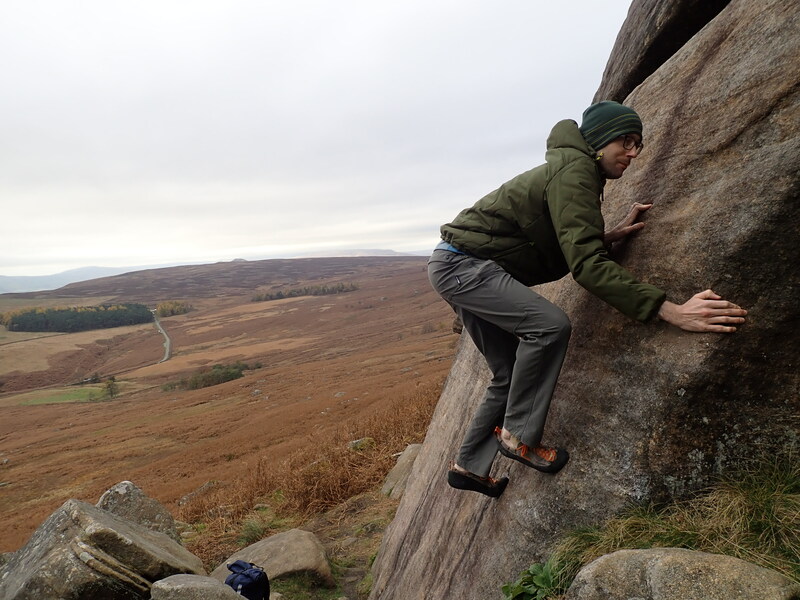 So, next time I’m bouldering at Stanage Plantation, I will try that problem again. Although I’d been climbing in the last few months, something I hadn’t done since I had injured myself was going mountain walking. I’d hurt myself on a stupid slip on some mud in the Brecon Beacons and hadn’t done any walking in the hills or mountains since. Partly that was because I needed recovery time and partly because I needed to build my strength up after the surgery. It was also because walking down stairs had hurt quite a bit until fairly recently, and so descending a mountain hadn’t seemed like a good idea. However, with my legs getting stronger, less pain and rain making bouldering impossible, on Sunday I didn’t really have any excuse for not working on this particular weakness. 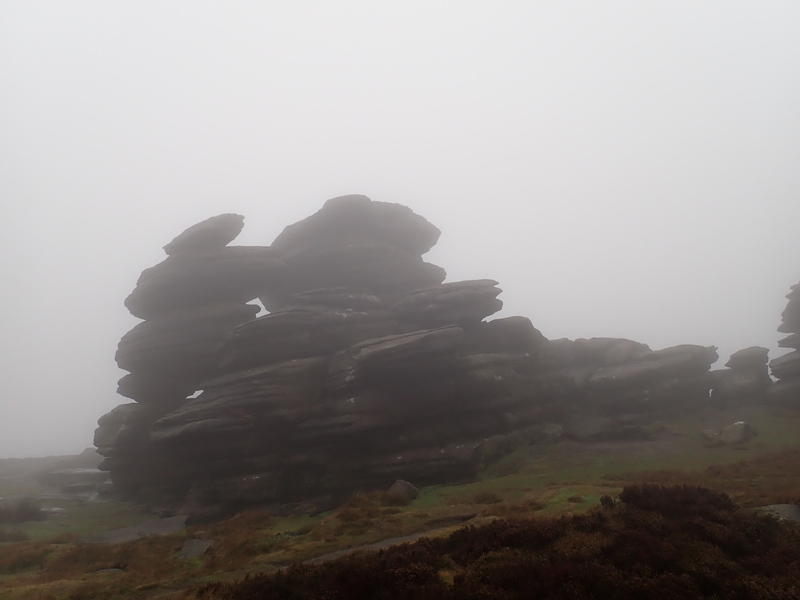 The Wheel Stones on Derwent Moor, looking a bit spooky in the mist. 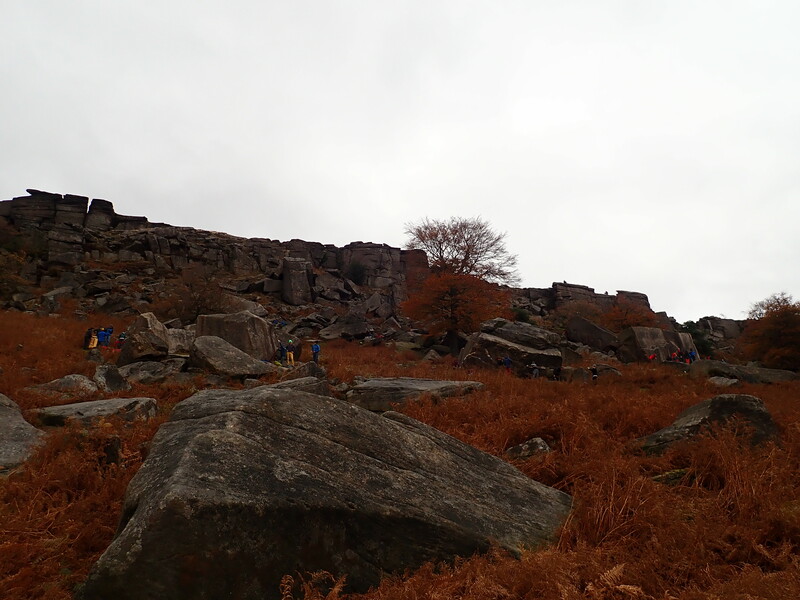 I did a gentle walk from Ladybower Reservoir up onto Derwent Moor, passing the brilliant balancing rocks of the Wheel Stones, and then along to White Tor. At that point I decided not to push it too much and came back. Although I found the ascent harder work than I would have done nine months ago, it was the descent that concerned me more. I spent more time focusing on carefully navigating patches of mud than I normally do, and focusing on how my knees felt. It felt good to get back without any problems. 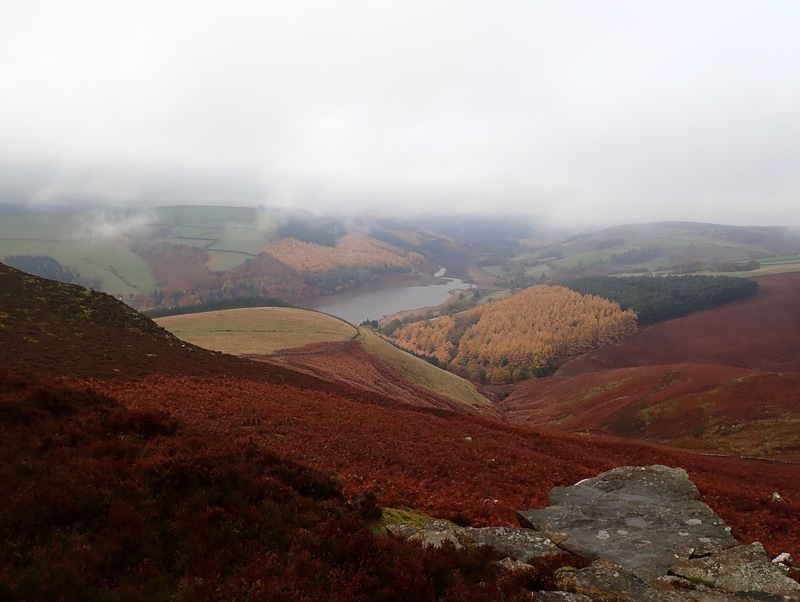 I even got a reward on the way down when with the clouds lifted to show the shores of Ladybower Reservoir and the surrounding hills in Autumn colours. There’s still a lot of work I’ve got to do, but rewards like that make it easier. Ladybower Reservoir seen from Derwent Moor. I admire your determination and congratulate you on your recovery. Are you planning to climb on routes soon tooor you feel it is too early? Thanks Mauro. It’s probably too early for routes. But hopefully next year. You’ve got some beautiful autumn colours there – ours all seem to have mostly gone – didn’t last long. Glad to hear you’re improving. I’m guessing you’ll be pretty wary on mud for a long time. Slips and falls always put me off for years! My good news was that the physio has already said I can go back to very easy stuff on the climbing wall (not bouldering – must be roped – but then I don’t boulder anyway). I found prior to having my hip done, when it was stiff and my leg was fairly weak, it couldn’t do a lot of moves and so I was smearing a lot with that leg. I never found it hard and it seemed pretty intuitive when you couldn’t just stick your leg straight up onto a hold. Thanks. There were some fabulous autumn colours. It was a nice surprise as I thought that they would have mostly gone by now. Thanks for the good wishes. I am slowly getting there. It’s great news that you can get back to climbing. I hope you continue to get better. I think which aspects of climbing come easily varies between people. For me smearing initially felt odd, but for other people I guess it will be something else. Glad to hear that your recovery is progressing and that you are back outdoors. Such a lovely part of the world! I have visited Stanage and Ladybower many times and it is lovely to see a little piece of home from abroad! Keep working at it – I am sure that it is frustrating, but you seem to be taking it in manageable steps! Thanks. I am pleased that you liked the post. It is great around there. There’s certainly alot to work at, but I’m going to keep at it.